Even though Marylin is for blondes it really keeps brown hair looking less orangy and bright. LOVE IT! Love the haul..esp baby face cleanser. 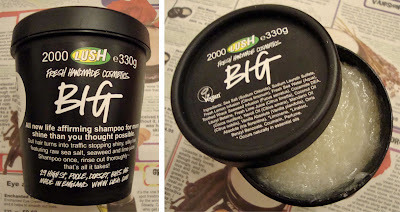 Im using BIG at the moment and i have found my holy grail shampoo... plus it is SO much fun to use!!! Ooh I just heard HG! I think I'm in that same boat...the stuff really is fun to use! I'm happy FOR you on this haul--I want to try some of these things also--especially the babyface. Maybe even just bc it looks so cute?! i have sensative skin also, so I can't wait for your Lush reviews. I love all the clothes. The sweater is amazing & i love the boots & feather! plz do a fotd when you where them. Wow! Great haul, you got loads of stuff. Let us know how Lush works for you! 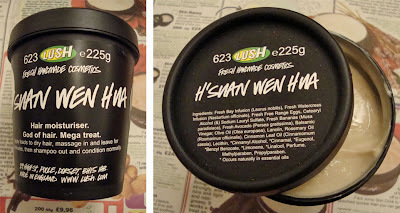 I'm going to Lush right now actually, what a surprise to see your post! I love the fresh face masks, I did a review on my blog ages ago somewhere, I think they work well and are such a nice relaxing treat. I've been wanting to try vanishing cream so please let us know how that goes! And that feather hair clip looks awesome. The tea tree water is my HG toner, it is so refreshing and I know you will love it! Please do a review on BIG as I have wanted to try it for ages, but am not sure if it will work for my hair. I love that cardigan too! Do they have it in any other colours? I go to LUSH a lot, but to buy bombs for my litle girl, she loves them and the bubbles too. I never buy nothing to me but always fell very curious, after some bad experiences I just play safe. Would LOVE it if you did reviews on those three! What a lovely haul :) I haven't tried that Big shampoo yet, and it's so tempting. Everybody seems to love it. I hope you'll like the Ocean Salt - I absolutely love it. I like Paradise Regained moisturizer, but it's maybe best for dry skin. I need it during winter time. Oh and I love that feather clip! 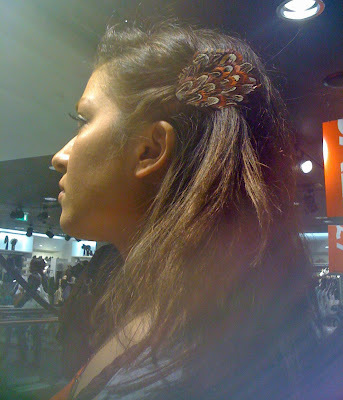 absolutely love the hair clip from h+m the way you're wearing it looks so 50s! Remember to let Baby Face dry out before you put it back in the tin - I learnt this the hard way with a solid shampoo bar! I got a sample of Big and it did nothing for me but I love the shampoo bars. Jumping Juniper is great for greasy hair. I'd love for you to review Ocean Salt as I've heard so many good things about it. I lovee the skirt, so pretty! Those boots are gooorgeous! I have been searching for a pair just like it! I've just started to use Lush and I love it! Can't wait to try the Big shampoo!! Let us know how you like the veganise conditioner. I got a sample of it once and it was nice, but 2 uses wasn't really enough to see if it worked..
Hi! I just stumbled across your blog! It's amazing and I think your makeup looks amazing on you!